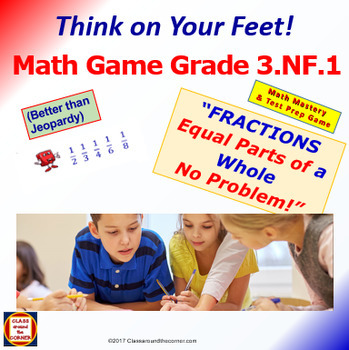 “Think on Your Feet!” Game – a better-than-Jeopardy interactive game to reinforce students’ practice and mastery of 3.NF.1: Understand a fraction 1/b as the quantity formed by 1 part when a whole is partitioned into b equal parts; understand a fraction a/b as the quantity formed by a parts of size 1/b. Click here for a short video: Your students will love this math mastery resource. 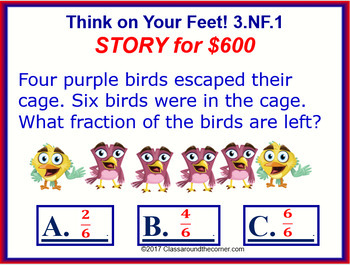 Click here to see Think on Your Feet in action. TRY BEFORE YOU BUY: Open the preview and try out this engaging “Jeopardy-type” game that reviews 3.NF.1. Enjoy the fast-paced questions with hyperlinks, sounds, keeping score, and eye-catching visuals. Based on the latest Growth Mindset developments of successful student engagement and collaboration. This exciting and engaging game is laid out in Easy, Medium, Hard, Tell Me a Story, and STRETCH categories – so that all students at every level can participate. •	Interactive PowerPoint designed for computer/doc camera, Promethean and Smart Boards. •	No Prep format: Plug in computer and go. •	25 engaging problems to promote fluency, collaboration and accountable talk. •	Two ways to master this math standard: 1. The class game. 2. Individual use or small groups recording the answers on a student answer sheet. •	Adherence to state and district standards. ~~~ Kid Tested—Educator approved: The feedback from TpT teachers and my fellow teachers at school, who use these grade-level interactive sets of task and game cards, state that kids are engaged and enthused; that the students are focused on the screen, calculating the problems, helping one another with the answers, laughing at the images and animations, and most of all – TALKING OUT LOUD ABOUT MATH. ACCOUNTABLE TALK: You will see your students become TEAM PLAYERS as they “talk it out” and problem-solve. They can pick an advisor, take a team vote or decide alone for the answers. The game provides immediate reinforcement of correct thinking about math. These 25 engaging problems progressively develop the standard and clarify the entire 3.NF.1. 3.NF.1: Understand a fraction 1/b as the quantity formed by 1 part when a whole is partitioned into b equal parts; understand a fraction a/b as the quantity formed by a parts of size 1/b. Copyright © Classaroundthecorner.com. All rights reserved by author. This product is to be used by the original purchaser only. Copying for more than one teacher, classroom, department, school, or school system is prohibited. This product may not be distributed or displayed digitally for public view. Failure to comply is a copyright infringement and a violation of the Digital Millennium Copyright Act (DMCA). Clipart and elements found in this PDF are copyrighted and cannot be extracted and used outside of this file without permission or license. Intended for classroom and personal use ONLY. See product file for clip art and font credits.